A wide range of home improvements can enhance your home’s overall look-and-feel as well as increase the value of your home. Green building improvements may reduce your carbon footprint by helping you conserve energy. Remodeling an area of your home may increase the square footage or improve the functional space. Replacing your door with a custom iron door creates a brilliant new entrance for your home, increasing the value of your home by improving the curb appeal as well as enhancing your home’s security. 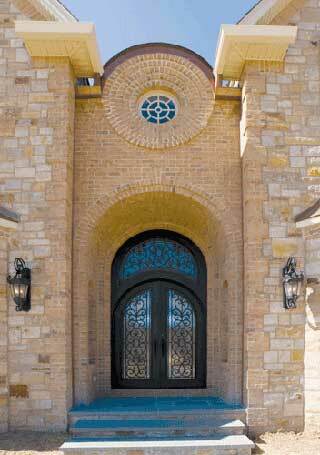 Portella Iron Doors designs and manufactures high quality hand-forged custom iron doors, railings and gates. Our wide selection of custom iron door styles includes old world doors as well as modern designs to compliment every home’s architectural design. Customers choose the iron door style, size, finish and specifications to suite their preferences, whether matching the exterior elevation of their home, complimenting an iron gate, or creating a new focal point at the home’s entrance. Replacing an existing front door with a custom iron door improves the appearance of your home and enhances your home’s curb appeal. First impressions make lasting impressions, whether you are planning to sell your home or simply want to improve the appearance. A custom iron door distinguishes your home from other homes in your neighborhood. Portella’s custom iron doors are manufactured from heavy metal and installed with the iron hardware and locks to meet each customer’s aesthetic taste and security needs. The MoMa Series of modern custom iron doors features strong, clean lines – immediately conveying solid, secure and ultra-contemporary. In addition to making a bold statement at the entrance, a custom iron door can alter the overall aesthetic of your home. Modern iron doors that replace an existing wood door, such as the Architect Series, create an new look for your home’s exterior. Whether integrated in your home as a transition to an outdoor living area or replacing your front entrance door, these exclusive iron door designs increase visibility with available light and create an open airy sense of added space.